I have so many things on my shopping wish list and dunno when I can have them all or I am not sure if I can really buy them at all. 1. HP Laptop - been eyeing this since last year bec. I want to have a laptop at home so I can still be online whenever I need it. I chose HP brand bec. I know that is is durable and can perform well like my HP desktop which I am using here at my store. 2. Canon Macro Lens o Canon extension tube - saw Faye's extension tube on her blog and it's not that expensive compared to the macro lens. 3.LCD TV for our living room. 4.New branded bag... hate my old cheapo bag for they are not durable enough. Book lovers find it so appealing to read book, books and tons of books and I just envy them and how'd I wish I can be like them . My niece Micah is a bookworm and loves reading novels esp. if the book or textbooks is a best seller like those of the twilight phenomenon by Stephenie Meyer and many other great authors and writers. I guess she already started Meyer's new book and already anticipating for the new movie sequel of Twilight. Teens love to idolize celebs esp. if they think that it has a very nice fashion style. VANESSA HUDGENS' way of dressing is one who is always copied and why not? She can carry most of the clothes that she wears and even would start a fashion style. Here's a set that I saw at polyvore where she is wearing a simple everyday attire. I love her Balenciaga bag. You can click the image to know where you can purchase the almost the same thing that Vanessa is using. A new tenant is occupying the space for rent beside my store. Mom was actually happy and very thankful that after many months of being idle, that space is occupied again so that means monthly money will be coming again for my mom. It's an office of a small contraction of steel works, roofing and many other services. I know with that kind of work or business, they always need a safety equipment that can make their work safety as much as possible. After a brief conversation with the owner, i find him sensible and quite considerate and I just hope he'd continue to pay their monthly rentals on time or else my mom will forcibly ask them to leave. Hmmmm.. how many times have you experienced when someone saw you again after long time and instead of greeting you nicely with a warm hello, they just say how come you are fat? or you are fat these day!. Oh gosh isn't that embarrassing at times? There are times that you will really ask yourself if you are really fat and now you will become so conscious about it and would even resort to perusing about the best diet pill on the net. I may not be fat or big but some comments are disheartening at times that I wish I can always watch my weight and what I eat. Oh well as long as I eat healthy and have control over what I eat, I am confident about myself. Yay, i opted to stay home today bec. I don't want to go to the malls bec. I might end up buying something that I really don't need again. Yay, you know sometimes, my impulse buying powers just comes out that I hate sometimes. But today, I just remember that I need to go to National Bookstore to buy some paper supplies that I need to make calling cards and invitations here for my shop. I have run out of supplies already so I guess I need to buy, I also would like to see if there are nice rubber stamps that I can use and if not I can just order it online. Sometimes, I have no clue that my supplies are need to be replenish, i reckon I need to check on them once in while so that I will not rush when I need it. Just came back home, I left my niece at the salon to have her nails done and for a hair spa. It will be a relaxing day for her there for sur, i left bec. I could not wait for her bec. I know it will take time so I went back home. I'm not going anywhere today, no shopping for me cuz I am saving for many things. I have lots of projects to buy this year so "my belt" is tightened up for a while. I am actually thinking of buying a laptop that I can use at the house. I prefer an HP one like my desktop here at my shop bec. I know it is durable and can perform well. I also would love to buy some accessories like a Hoya filter and lens hood for my DSLR camera. Oh boy my photography hobby is getting expensive huh. Right now I am just here are my store (eventhough it is closed, surfing and at the same time flippin' some magazines when I got bored and watching at the TV. yay, multitasking lol. Just noticed at the mags and shows that celebs are getting thinner and thinner each day huh, i bet they are using diet pills, exercising much or starving themselves to make them look that way. Sometimes it's not healthy looking anymore. Hmm just my thoughts today. My niece Kuks and I went to church this morning and after lunch, I accompanied her to our favorite nearby salon. The owner and our favorite hair cutter was not there to cut my niece's hair but we are already there so we just settle for him instead. I just told him the cut that I wanted for my niece and looked while he was doing it. There is no manicurist at that time too so we just settled for the cutting of hair. It was weird not to see the hairdresser wet the hair. He just cut it after combing it. Hmmm I am guessing that is the new technique or perhaps he is just in a hurry bec. a uute new customer came for his service hehe. Anyway, the cutting was just in a flash, I think only around 30 mins. or so. He did ironed her hair too and I asked him to shave her eyebrows. Oh well it was a nice cut, he cut off about 4 inches of her hair and she loved it. I'm a bagaholic that sometimes I just buy anything that i like eventhough it is not branded one coz I also can't afford to buy real designer bags lol. There are however affordable bags that are also durable and stylish yet not that expensive. I know I can't buy LV bags but these Nine West bags are good enough for me. 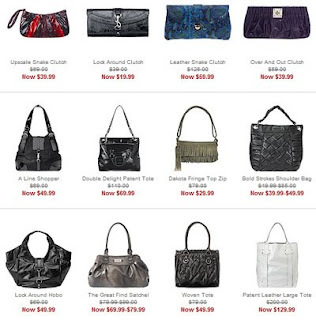 They have nice sale bags right now and just in case you want one then head over at ninewest.com, who know you might grab many in your shopping cart. Happy Shopping! Now that the holiday is over, our pantry is empty again and so I hurriedly went to the nearby big grocery at our place yesterday before I open my shop to buy some stocks. I was in a hurry and when I was about to pay for the grocery items that I bought, the cashier asked for my membership card but oh boy i forgot to bring it coz it was at my other wallet. Yay, I could have earned more points from them bec. everytime I buy from them they swipe my card and I will earn points that I can use anytime I want. I guess I should have checked it before I head at the door. Christmas is no doubt the most awaited occasion of the year around the world mostly by the kids. It is when they can ask their parents, santa, and relatives to give them what they wanted. It's always a joy to see the kids' eye lit up when they are opening their presents. Their joy is incomparable. Just take a look at my nephew when he saw his gift. It was a Bionicle toy from my sister and he liked it. Actually he was the one who asked for it, i bet net time he'll ask for a sports watch already (maybe one of the and Luminox watches that he saw online. Kids are becoming more techy too, they love gadgets as well and in no time they will be asking for these and wish we can give such to them. Yay, it's been days that we have experienced such a cold spell. It's such a breather from the long hot temp that we had in the past months. Old jackets or shawls are now being taken out of the cabinets bec. of the cold weather. More people are seen wearing them even in the afternoon, such a sure sign it is cold. I heard on the news that the coldest this month is at 19C and they say it will continue till next month. Brrrrrr..
We are in a tropical country so a sudden drop of temp will make us shiver already. My mom is not enjoying it anyway, you'd see her with her socks on during the night and we can never take a bath with a cold water. I am sure it's more comfortable if we have a tankless water heater at home. The weather makes us a bit lazy to get up each morning plus people are more prone to get sick. Right now I have a sore throat and have been eating lots of citrus fruits. Hey all, wishing you all a very Happy New Year!! I hope 2009 will bring you goodluck.. and more SHOPPING spree for all of us hehe. January 3, I already shopped and my very first purchase is a casual navy blue collared t-shirt. My niece and I went to see a local movie last Thurs. and of course afterwards stroll the mall. There are many sales esp. the toys that have not been sold during the Christmas season and they are selling for 50-70% off. It's the perfect time to shop as sale are still everywhere, the only problem is if we still have money to buy..lol. I saw a red bag at Marithe and Girbaud store in Galleria and it was on sale. Yay, I wish can buy that one. I'm keeping my fingers crossed that it is still on sale till feb bec. right now I am still broke haha.